<!- banner ad --> Your clickable banner could be here: details If you cannot see an advert click here. 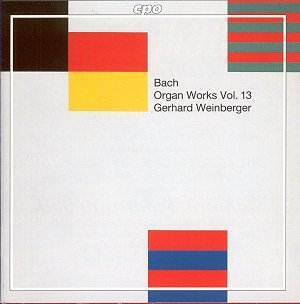 Volume 13 of what is presumably a complete edition of Bach�s organ works announces the third part of the Clavierübung. One might suppose that the entire work would be presented, but it is not that simple and the matter is only passingly alluded to in the booklet notes. The third part of the Clavierübung is framed by so-called "St. Anne" Prelude and Fugue, which owes its English name to the coincidental resemblance of its fugue theme to Croft�s hymn-tune "St. Anne", usually sung to the words "O God our help in ages past". This particular combination of notes was part of the lingua franca of the Renaissance-Baroque period and some two hundred years earlier Sperindio Bertoldo (c.1530-1570) had written a ricercare which any English listener would swear was a fughetta on "St. Anne". Separating the Prelude from the Fugue are 9 chorale preludes sometimes known as the "German Organ Mass", since they correspond to the Kyrie and the Gloria, 12 "Catechism Songs", which are chorale preludes based on Lutheran hymns, and, rather out on a limb, 4 Duets. 21 Chorale Preludes, then, and, as you can see, only 10 are played here. Weinberger�s own notes blandly remark that "Bach offers each of the chorale preludes in two alternatives: a �little� arrangement manualiter is set over against a �big� arrangement pedaliter, with only the Gloria Allein Gott in der Höh sei Ehr being set three times by him". While I am sure Weinberger has no intention to mislead, he may unwittingly give some readers the idea that the manual-only preludes are simplified versions of the ones with pedals and therefore dispensable (in fact he plays none of them); in reality they are completely independent compositions, some very brief, a few quite extended, and not intrinsically less beautiful than the pedalled preludes. The problem is that their inclusion would have meant a second disc, which would then have needed to be filled with other music. Maybe the intention is to record them later on (a disc grouping together all Bach�s manuals-only pieces played on a chamber organ, perhaps?) but their place is really here. The omission of the 4 Duets � which are not duets for two players but two-part inventions, or duets between the two hands � is more understandable since these tend to be considered (though Bach did not say this) as harpsichord or clavichord pieces; the intimate expression of the first is ideally suited to the latter instrument and its highly chromatic nature risks being blurred by an organ in a church with a long reverberation period. Even so, they belong here. Other candidates for conclusion would have been a variant version of the manuals-only Allein Gott in which the chorale theme is separated out by putting it in the pedals, a much short and simpler (presumably earlier) version of the pedalled chorale on this same theme, and a variant of the manuals-only Vater unser. Books I (the 6 Partitas), II (the Italian Concerto and the French Overture) and IV (the Goldberg Variations) of the Clavierübung are core repertoire for early music keyboard players and pianists alike. Apart from the "St. Anne" Prelude and Fugue, Book III tends not to be loved by organists in the same way. Bach here took his chorale-prelude techniques � which he later expressed so simply and memorably in the universally loved Orgelbüchlein � to often dogmatic extremes. Most notably, in Vater unser the canonic treatment of the chorale theme, combined with two-part writing dominated by jerky rhythms that are very difficult to render in a way that sounds natural, and a practically unvaried quaver movement in the bass, is stretched to nearly ten minutes that can seem interminable. Organists are inclined to pass them over as too elaborate for use as service-music, and less attractive than much other Bach when it comes to a recital. On the whole I don�t think these performances will change anybody�s ideas, but let me start by saluting a really superb performance of the last, Jesus Christ, unser Heiland. The leaping exuberance of Bach�s counterpoint is rendered with unflagging energy and a registration which fills the air with sound while yet retaining complete clarity. Almost on the same level is Christ, unser Herr, zum Jordan kam in which Bach�s cool two-part writing set against the rippling waters of the Jordan is entrancingly clear. Here I have to express some reservations over Weinberger�s registrations, which are listed in the booklet, together with full specifications of the organ. The mixture of Gedackt 8, Principal 4 and Hautbois 8 on the first manual for the left hand is gorgeously piquant, and at first the use of the Spitzflöte 8 and the Nasat 3 on the second manual for the right hand seems absolutely lovely. The Nasat so dominates that I was convinced at first that only a 2-foot stop was being employed. After reading the registrations I listened again and admit that the Spitzflöte can be heard gently humming below, but the effect is rather like listening to a duet of descant recorders: at first enchanting but wearing on the ears as the music goes on. Organists of a more romantic school would have changed the registration from time to time. Weinberger quotes extensively from an early authority, Griepenkerl, in support of the view that registrations are not to be changed during a piece. This is obviously in line with baroque views on instrumental colour; when Bach writes an aria with obbligato, for example, he sticks to his chosen instrument throughout. He does not switch from, say, oboe d�amore to the flute and back again. But if Weinberger wishes to adhere rigidly to this theory he should avoid using stops which might tire the listener�s ears before the music is over. However, Griepenkerl does admit the changing of colour during a piece by switching to another manual. Since Weinberger has three manuals to play with and only uses two of them, why not pull out the Rohrflöte 8 and the Spitzflöte 4 in manual III and maybe move the right hand there for the repeat of the first part and then back for the second section? Authenticity is all very well but the results have to attractive to the modern listener and I�m not proposing anything that couldn�t have been done on the larger organs of Bach�s time. We tend to think of baroque organs as fairly small, and performers of Bach on 19th and 20th Century organs are expected to avoid too many heavy combinations that would not have been available to Bach. The organ used here is almost exactly contemporary with the music. It is the finest product of the (probably) Silesian-born Christoph Treutmann the Elder and it was restored to its pristine glory in 1989-92. It shows that at its largest, a baroque organ could be endowed with a range of stops, including several 16� and a bone-shaking 32� for the pedals, that gives it possibilities not far short of the later romantic instruments. The question is how far you should use them. When Weinberger roars through Kyrie, Gott Heilger Geist with his Manual III engaging practically everything from the Principal 16 through to the mixtures and the Trompete 8 (he spares us the Trompete 16), coupled to a fairly heavily registered Manual II (no Fagotto 16, thank heaven), and with every pedal stop pulled out, I can�t say this is anachronistic since it proves that there were organs around in Bach�s time which could do this; but the effect is more that of a Victorian monstrosity than a baroque organ and the music sounds more like Reger than Bach. Indeed worse, since Reger would not have expected such a combination to be maintained doggedly for 5-and-a-half long minutes. The ear simply tires of it, however thrilling it may be in small doses. Nor does it help that Weinberger, though not basically a very interventionist interpreter, allows little half-commas here and there to impede the rhythmic flow. And this latter is my other real reservation. In the slower pieces the music is never allowed to generate that sense of inexorable movement which can carry the listener through the longest Bach pieces. Both Dies sind die heilgen zehn Gebot and Vater unser im Himmelreich are well registered but if only they could flow just a tiny bit more; they are allowed to lapse into an uninspiring plod. Organ fans will like to hear this instrument, splendidly recorded, and they are assured at least some successful performances. The more general music lover wishing to acquaint himself with these works is advised to look elsewhere.